The War Head crew is passionate about Warhammer 40K, Classic Warhammer Fantasy Battle, historical wargames and visual arts. The entrepreneur, author and founder of the site is a wargamer whose interests also include cinematography, literature, chips and the National Hockey League. 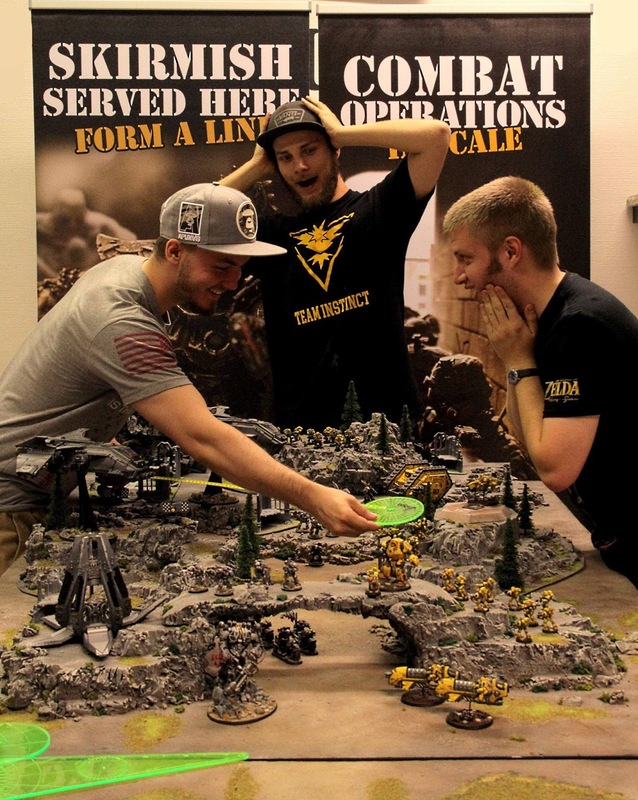 War Head is a miniature wargames retailer, a hobby blog and a tight-knit team. Our website is a way for us to convey the passion and excitement of our hobby adventures, whether it's a scenery workshop, a long-planned battle or an exciting tournament journey. War Head is all about sharing experiences, interacting with fellow hobbyists and giving something back to the community - and to the dear hobby of ours. War Head organizes tournament events, hobby meetings, participation battles and does commission work in painting single figures and armies as well as creating wargaming terrain for the use of companies and individual gamers. Our hobby experiences, work in progress pics and battle reports are documented here on our website. Most of this blog is in Finnish but we are happy to discuss hobby matters in English as well. Easiest way to contact the crew is to leave a comment below or to email us at contact@gowarhead.com! You can also follow us on our Facebook channel - the content is entirely in English. "Constantly 40K-driven but interested in several game systems, I've tried to embrace both the competitive and the artistic sides of the hobby. Scratchbuilding, army painting, completed unique forces and exciting battles are where it's at." "Eric is one of those dedicated artistic hobbyists who always have a new project bubbling under. In addition to concentrating in improving his Lord of the Rings miniatures collection, Eric is also a serious enthusiast in the historical wargames genre." "The biggest and most intense battles won't happen without Hese around. Always contemplating on a new campaign or a scenario concept, we've had countless of memorable skirmishes and mega battles together. Massive armies, massive fun!" "The single best guy to work on projects with, Ollie's modelmaking skills, ideas and painting supremacy just keep on inspiring. As our showcase model specialist Ollie is a regular entrant in domestic painting competitions, often performing with golden success!" "A great addition to the War Head roster, Johannes has entered the active wargaming world again after a few on/off-years. Known for playing only movement and assault phases in 40K, this fluff purist is a valuable asset for the War Head field operations." "Juha is War Head's revered veteran and adds a pinch of historical spice to both of our games variety and the miniature collection. In addition to being known as a true fluff gamer and as the pioneer in Finnish Force on Force gaming circles, Juha has been recognized for promoting the historical wargaming hobby in the domestic scale." "Noa is our long-time hobby pal and one of the creative actives of War Head's inner circle. Our most trusted tournament substitute has a collection of Perturabo's disciples for both 30K and 40K systems. Noa's vision for amazing scratch-built armies has begun to bloom during the recent years, paving way for projects such as Killa-Kult Mekanikus." "Ville has to be one of the most energetic miniature painters in Finland, completing a detachment after another on an almost weekly basis. Some of his mini-projects are for gaming and some just inhabit cabinet shelves, but Ville's progress pics alone seem to be enough to provide the necessary content for a dozen of Facebook groups! Poromagia is a rising star, coordinating their retail operation through the popular webstore and a colourful store location in Pasila. Specialising in Magic the Gathering and other Trading Card Games along with a great selection of traditional boardgames, Poromagia has recently upgraded their assortment with retro video games such as popular NES and SNES titles. Poromagia is also amazingly active in arranging tournament events, see for yourself! Oh My Game is something that springs out of a love for the hobby. We were delighted to hear the news when our former co-worker Supi told us he had decided to start his own retail company. His long-time fondness for the universe of gaming both on screen and on the tables is a strong foundation for the store and Oh My Game's presence in Kauppakeskus Myyrmanni is an impressive fruit of the young entrepreneur's labor. It's a service from players to players and something we're proud to be associated with. Head Hunter Store is a whirlwind of amazing craftsmanship and imagination. It offers a selection of custom-made and hand-finished statues, prop replicas and dioramas of movie, game and comic icons. When not amidst another crazy modelling project, Head Hunter is constantly on the road presenting their latest stuff in events and exhibitions. The manager (and our good friend) Dean can also be visited in his inspiring studio-store location in Pasila. Check out his website for the unique products and the events calendar! All associated marks, names, races, race insignia, characters, vehicles, locations, units, illustrations and images from the Blood Bowl game, the Warhammer world, the Talisaman world, and the Warhammer 40,000 universe are either ®, TM and/or © Copyright Games Workshop Ltd 2000-2018, variably registered in the UK and other countries around the world. Used without permission. No challenge to their status intended. All Rights Reserved to their respective owners.